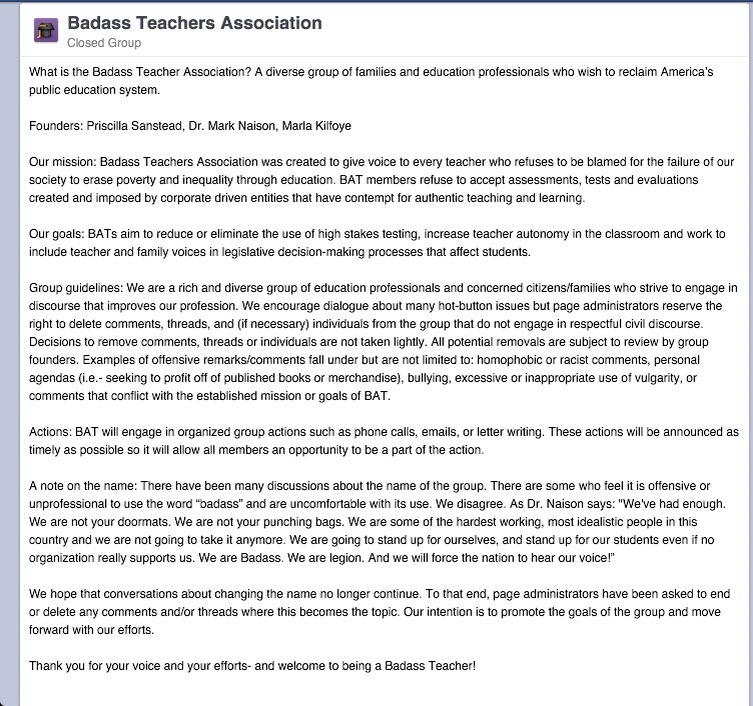 In the last two weeks, a closed Facebook group of Badass Teachers has grown to nearly 19,000 members. (A screen shot of the groups description is pasted at the end of this post.) The name itself has generated a discussion of “professionalism,” leading to a post by one of BAT’s founders, Mark Naison, that anyone unhappy with the name might start her/his own organization. In fact, he reported that he had tried to start another organization called “Dump Duncan” (http://dumpduncan.org/) and it never took off. It has less than 2000 members on Facebook. In the US, many educators were optimistic for national leadership on education, when Barack Obama was elected to his first term. Many of us had heard, and were encouraged, that Kris Gutierrez was among his first advisors. Alas, hope is audacious! Obama appointed Arne Duncan, which many (now and then) refer to as his basketball buddy, rather than an educator. Kenneth Saltman and Henry Giroux describe the situation early on in 2008. I have been interested in the diversity within this group reflected in the posts…. One post that struck me promoted the Freedom Writers film and materials as Badass. I couldn’t disagree more. For me, Freedom Writer’s is a White teacher savoir narrative. It also points out the problem with individualizing the responsibility for social inequity at the level of the teacher. Another post suggested that we needed two organization, one for Republican fiscal conservatives and another for Democrats. Finally, while I celebrate teachers, and especially Badass ones (and we need hero/resistant narratives, too), I like the way Aurora Levins-Morales (1998, 31) puts it: Stories of accommodation, collaboration and outright defeat are just as important because they give us ways to understand our position as caused rather than just existing. For example, one post suggested that we needed to proofread all of our posts (that texting-style) would be inappropriate and used against us. For me, this marked the insecurity of teachers and the unrealistic expectations placed on teachers by the public, as well as a focus on the surface rather than substance that plagues education today at all levels. Among many uncertainties about the work/change this group may be able to produce, what seems clear to me is the challenge of working across difference in large social movements.